Since 2004, under the framework of the Partnership on Measuring ICT for Development, the ITU has been working together with National Statistical Offices from developing countries around the world to improve the availability and quality of statistics on ICT access and use by households and individuals. To this end, ITU has been providing training courses on measuring ICT access and use by households and individuals in developing countries and collected data gathered through official household surveys, through an annual questionnaire. Data collected on use of ICTs by individuals include breakdowns by gender, age, educational attainment, urban/rural, labour force status and occupation, and include information on the use of the Internet, computers and mobile cellular phones. Gender-disaggregated data collected through official surveys are nationally representative, reliable and can be compared among countries, and over time. They provide an important input for policy making, especially since the inclusion of socioeconomic and demographic variables - including age, income levels, educational attainment, etc. - provide in-depth information on the use of ICTs by men and women. By 2010, 72 countries out of ITU's total membership (192) had been collecting ICT use data through official surveys. 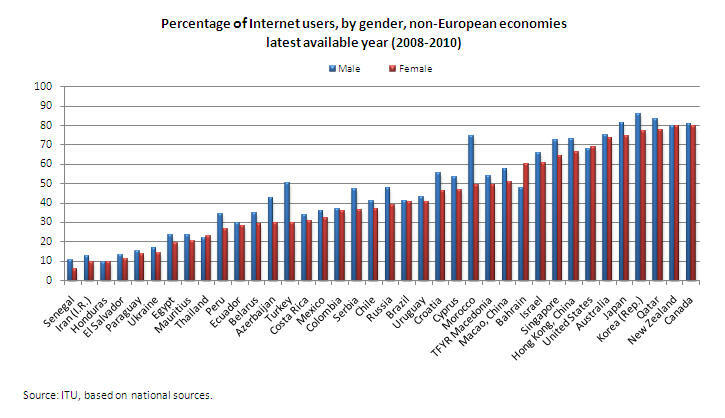 Thirty-four developing economies had collected ICT use data between 2008 and 2010 and most of these countries collect data on Internet users disaggregated by gender. 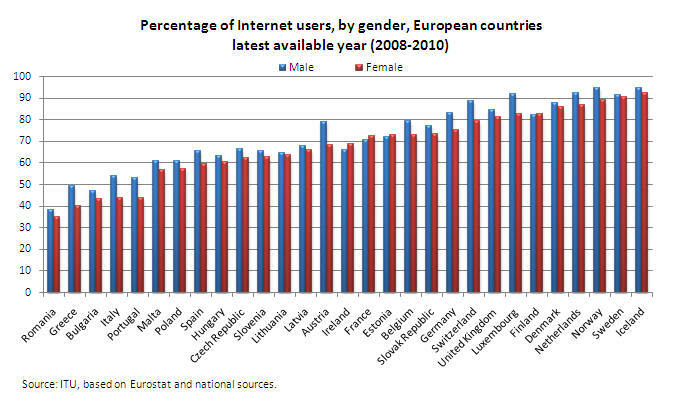 The following two charts show the percentage of Internet users, by gender, for European countries (left) and non-European countries (right), for the latest available year (2008-2010). Click on chart to see data.